· The Introduction offers safety tips, information on purchasing a parachute, and ideas for more fun ways to use parachutes. 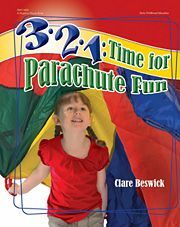 · The chapter "Parachute Games - No Props Necessary" includes activities that only require a parachute, like The Parachute Pokey, Under the Big Top!, and In My Tent. · The last chapter, "Playing Parachute Games with Props," is full of activities that use easy-to-find props, including: Into the Bucket You Go!, Matching Pairs, and All Dressed Up. Each activity includes step-by-step instructions, and many also include ideas for expanding activities to support further learning. Children ages 3 - 10 will love these easy and fun activities.